Song is short, high, insect-like buzz. Description: Sexes similar. 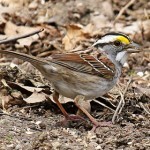 White central crown stripe, buffy at rear of crown; chestnut streaking on nape. Broad, bright buffy-orange eyebrow; blue-gray ear patch; black crown stripes and eye line. 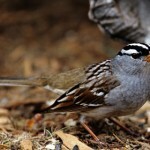 Brown upperparts; orange-buff breast and sides; dark streaking on sides of breast and flanks; white belly. 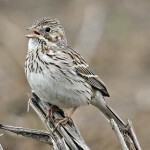 Juveniles are buffy overall, with tawny crown stripe and heavily streaked breast. Behavior: Secretive; scurries through grasses like a mouse. Habitat: Wet grassy fields and meadows, and marsh edges with sedges, cattails, and deep grasses. 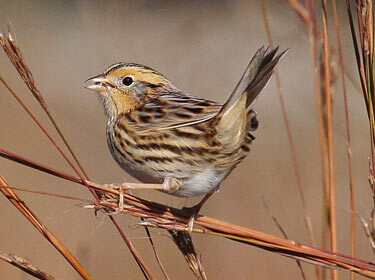 Where in Nebraska: Uncommon but regular spring and fall migrant in eastern Nebraska. Rare or absent in the west. Fun Facts: The first Le Conte’s Sparrow was not discovered until 1790 and the first nest was not discovered until 100 years later.